FoodSaver Vacuum System only $9.44 w/ $10 off Coupon! Head over to Coupons.com to print this awesome FoodSaver coupon. Bring it to Walmart to score a handheld vacuum system for under $10! These are great to use when you have leftovers or want to prep the week's meals in advance. 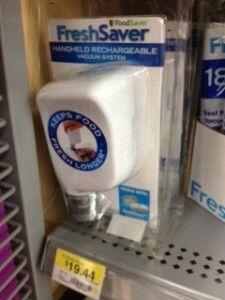 I have one and use it all the time and it really does a good job at keeping food fresh!